where selectedIndex is the index in the TableView interested. 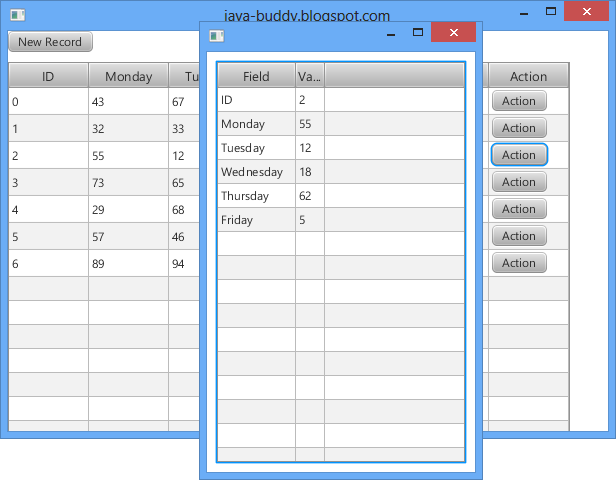 Extend from last article of "Embed Button in TableView", implement EventHandler of the embedded button, th read data of the selected row and display on another TableView within dialog. Where is the code for getTableRow()? you have one of the best javafx tutorial pages (if not the best) around. I think there is a problem with this tutorial. The class values are not affected by any element modification in the TableView. When the action button is clicked, the old values are displayed. Thank you for all these so interesting tutorials. You are right, I missed handle of col.setOnEditCommit. But I found more problem when compile with JDK 1.8/JavaFX 8!